Dr. Jay Faber, an accomplished and highly regarded psychiatrist working with adults, adolescents, and children, has written the new book “ESCAPE – Rehab Your Brain to Stay Out of the Legal System.” The book offers a compelling and insightful read for those individuals who regularly break the law and need to find proven methods of dramatically changing their ways and thus getting their lives back on track. He believes the key to making a change of this magnitude is transforming an unhealthy brain into a healthy one. In addition to providing the essential components for improving the health of a person’s brain, Dr. Faber includes the real-life stories of those who have been able to significantly transform their lives and stay out of the legal system. The book also includes a series of exercises Dr. Faber hopes each reader will engage in as he believes these are a critical aspect of self-examination and the overall rehabilitation process. 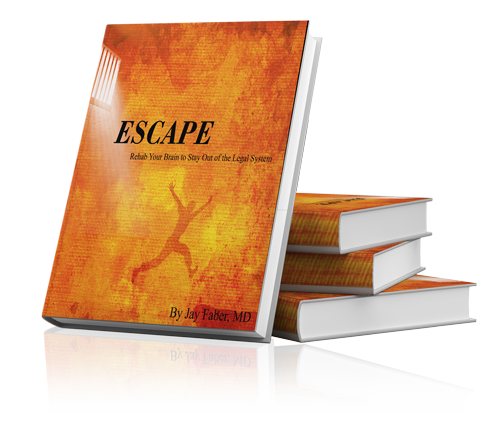 This is a free resource and Dr. Faber hopes those who read and follow the recommendations of “ESCAPE” will successfully change their ways and live the rest of their lives far attorney offices, courtrooms, jails, and prisons.